Discussion on defining district borders for Boston is in progress. If you know the city pretty well, please share your opinion on the talk page. For other places with the same name, see Boston (disambiguation). Boston is a huge city with several district articles containing sightseeing, restaurant, nightlife and accommodation listings — have a look at each of them. Located west of Boston proper, these districts (especially Brighton) are primarily residential, and are home to many students and young professionals. Brighton is abutted Boston College, which is the terminus of the Green Line's B Branch. The border between the two is a fuzzy subject of debate, so they are often considered as one neighborhood by outsiders. This upscale area of Boston has fine shops, fine dining, as well as sites such as the Prudential Center, Copley Square, and Hynes Convention Center. Once the neighborhood of the Boston Brahmins. Beacon Hill has real gas-lit street lanterns on many of the streets, as well as many original bricks dating back to age of the city itself. Because the Massachusetts State House is located here, "Beacon Hill" is often used as a metonym to refer to the state government or the legislature. Across the Charles River to the north, this is the site of the Bunker Hill Monument. Great Asian food, great herbalists and next to downtown and the theater district. 4th largest Chinatown in the United States. A large working class neighborhood often considered Boston's most diverse. It includes the JFK Library, UMass Boston, and many wonderful eateries. This is the hub of tourist activity with Faneuil Hall, the Freedom Trail, Boston Public Garden, and Boston Common. It is also the center of city and state governments, businesses, and shopping. On a peninsula across Boston Harbor from the main bulk of the city and the location of Logan Airport. Several underwater tunnels connect East Boston to the rest of the city. Large Latin American population. 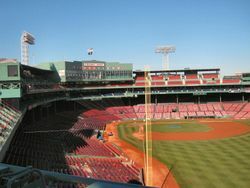 Fenway Park is the home of the 2004, 2007, 2013, and 2018 world champion Boston Red Sox. This area also includes a number of Boston bars, eateries, and the "Lucky Strike" bowling alley. Boston's business and financial center, this area has plenty of restaurants, bars, and tourist attractions such as the New England Aquarium. A diverse residential neighborhood and home to Samuel Adams Brewery. A residential neighborhood, with a very large student population. The city's Italian neighborhood with excellent restaurants. It is also the location of the Old North Church. The historical center of Boston's African-American community. This is a proud residential neighborhood with a waterfront district and the Boston Convention and Exhibition Center on its north side. Home to one of the largest Irish and Irish-American populations in the country. Just south of Back Bay, has Victorian brownstones and a Bohemian atmosphere. Large gay population. Among Boston's many neighborhoods, the historic areas of Back Bay, Beacon Hill, Chinatown, Downtown, Fenway-Kenmore, the Financial District, Government Center, the North End, and the South End comprise the area considered "Boston Proper." It is here where most of the buildings that make up the city's skyline are located. The Back Bay is one of the few neighborhoods with streets organized on a grid. It is so named because it used to be mud flats on the river, until the city filled in the bay in a land-making project ending in 1862. It is now one of the higher-rent neighborhoods in the city. The north-south streets crossing the axis of Back Bay are organized alphabetically. Starting from the east, at the Public Garden, and heading west, they are: Arlington, Berkeley, Clarendon, Dartmouth, Exeter, Fairfield, Gloucester (pronounced 'gloster'), and Hereford. After Hereford Street is Massachusetts Avenue, more commonly known as Mass. Ave., and then Charlesgate, which marks the western boundary of Back Bay. The alphabetical street names continue a little way into the Fenway neighborhood on the other side of Charlesgate, with Ipswich, Jersey, and Kilmarnock, but the streets are no longer arranged in a grid. New England is unpredictable and becomes very cold in the winter and is prone to mild bouts of humidity in the summer. 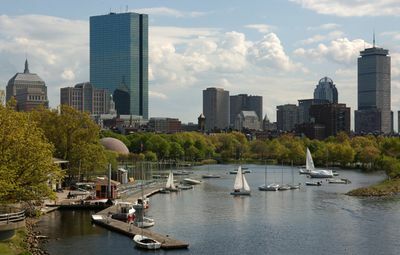 The vast majority of tourism in Boston takes place in the summer, from late May through late September, when the weather is ideal and the most attractions are open. Boston summers are quite comfortable, with sunshine 60-65% of the time and and highs in the mid 70s to low 80s F (mid to upper 20s C). When the heat does start, there are some beaches within the city, and many beaches outside of it, for swimming. The Standells classic "Dirty Water" doesn't apply any more as the water is safe to swim in thanks to the Boston Harbor Cleanup project. Beware that no matter how hot it is outside, the ocean water will not be warm. Early and late summer tends to be nice, but this varies by year. In that time, the temperature will be perfect, and there will be no humidity. The city does have unpredictable stretches of heat between late June and early August when low 90s and high humidity are expected. All public transit options, including cabs, buses, and the subway system (called the "T") are air-conditioned. If you visit during the less busy wintertime, the Atlantic Ocean has a large moderating effect on temperatures. The average low in January is 22F/-5C, so as long as you dress appropriately, you should be fine. Massachusetts' first governor, John Winthrop, famously called Boston a "shining city on the hill," a reference to Jerusalem and a declaration of the original settlers' intent to build a utopian Christian colony. From the very beginning, the people who lived there declared their home to be one of the most important cities in the world. The father of American jurist Oliver Wendell Holmes, Jr. (Dr. Oliver Wendell Holmes) once called the Boston statehouse "the hub of the solar system," but common usage has expanded to the now-current Hub of the Universe. This half-serious term is all you need to know to understand Boston's complicated self-image. Vastly important in American history, and for centuries the seat of the USA's social elite, Boston lost prominence in the early twentieth century, largely to the cities of New York, Chicago, Los Angeles, and San Francisco. Over the past two decades, Boston has regained political, cultural, and economic importance. In 1629, English Reverend William Blackstone was the first English immigrant to arrive in the city. A year later, John Winthrop and the Massachusetts Bay Colony had followed. The Massachusetts Bay Colony were Puritan religious dissidents who had fled England to find freedom in the New World. At the time the city was called Shawmut, a name coined by Native American settlers, however now a new settlement, Winthrop had decided to rename the city Boston after his hometown in England. Because of its easily-defended harbor and the fact that it is the closest port to Europe it rapidly assumed a leading role in the fledging New England region, with a booming economy based on trade with the Caribbean and Europe. The devastating Fire of 1760 destroyed much of the town, but within a few years the city had bounced back. Boston was also a city of great intellectual potential. Many statesmen had emerged in Boston along with prestigious Schools such as Harvard and the first public school in America, Boston Latin. With the founding of these schools as well as the first printing press in New England, Boston was becoming more of a colonial society. Bostonians were the instigators of the independence movement in the 18th century and the city was the center of America's revolutionary activity during the Colonial period. Several of the first Revolutionary War skirmishes were fought there, including the Boston Massacre, The Boston Tea Party, and the battles of Lexington and Concord -which were fought nearby. Boston's direct involvement in the Revolution ended after the Battle of Bunker Hill and, soon afterwards, the ending of the Siege of Boston by George Washington. For some time afterwards the city's political leaders continued to have a leading role in developing of the new country's system of government. The residents' ardent support of independence earned the city the nickname The Cradle of Liberty. Throughout the 19th century, Boston continued to grow rapidly, assimilating outlying towns into the metropolitan core. Its importance in American culture was inestimable, and its economic and literary elite, the so-called Boston Brahmins assumed the mantle of aristocracy in the United States. Their patronage of the arts and progressive social ideals was unprecedented in the New World, and often conflicted with the city's Puritan foundations. They helped drive unprecedented scientific, educational and social change that would soon sweep the country. The Abolitionist movement, anesthesia and the telephone are a few examples of this. At the same time, the city's working class swelled with immigrants from Europe. The huge Irish influx made Boston one of the most important Irish cities in the world, in or out of Ireland. Gradually the Irish laborer population climbed into city's upper class, evidenced no better than by the continued importance of the Kennedy family in national politics. From the early twentieth century until the 1970s, Boston's importance on the national stage waned. Cities in what was once the frontier, like Chicago, San Francisco, and later Los Angeles, shifted the nation's center of gravity away from liberty's cradle. In the past two decades, Boston's importance and influence has increased, due to growth in higher education, health care, high technology, and financial services. It remains America's higher educational center; during the school year, one in five Bostonians are university students. There are more college students per square foot in Boston than any other city in the Western Hemisphere. Boston's nicknames include "Beantown", "The Hub" (shortened from Oliver Wendell Holmes' phrase 'The Hub of the Universe'), "The City of Higher Learning" (due to the plethora of universities and colleges in the Boston area) and - particularly in the 19th century - "The Athens of America," on account of its great cultural and intellectual influence. If you don't want to stand out as a tourist, don't refer to Boston by any of these nicknames. Locals generally don't use any of them, except the heavy use of "Hub" in journalism (Boston takes up more headline space). Boston Logan International Airport, +1 800-23-LOGAN (56426), (IATA: BOS) is the main gateway to Boston and New England. It is in East Boston, 3 miles from downtown. Free buses operate to all terminals and connect the airport with the MBTA Blue Line Airport Station. Terminals A, B, and C are mainly domestic; Terminal E is international and Southwest/AirTran. There is no Terminal D.
The MBTA Blue Line Subway and the Silver Line Bus go to Logan. The Silver Line is a low-floor articulated bus that stops at each terminal every 10 to 15 minutes, from 6AM to 12:45AM every day (5:35AM start M-Sa). From the airport, the bus travels along the South Boston waterfront and terminates at South Station. Convenient transfers are available to the Red Line, south-side commuter rail trains, and southwesterly Amtrak trains. The Silver Line is free FROM Logan and allows free transfer to the Red Line at South Station. For inbound Red Line service with lots of luggage, you may want to use the elevator to the right as you exit the Silver Line bus. There is no escalator down. To get to/from the Blue Line Airport station from the airport itself, you need to take a free Massport shuttle (check the signs outside the terminals to see which ones to take). Tickets are $2.50: tickets can be purchased using the machines at the station. The last Blue Line train leaves Airport station shortly after about 12:30AM. To connect to the Red Line, use the Silver Line instead. Taxis are more expensive than in many other cities. Fortunately, the airport is very near the city so the fare is not extremely expensive, if your driver is honest. It would be about $25 for fares to Boston, and less if you are staying downtown in the financial district. If you're not driving or being picked up, you'll need to take a taxi if you are at the airport when the T is not running. A number of travelers have reported taxi drivers taking longer routes on purpose, falsely claiming a $40 flat fare to downtown Boston (there are no flat fares from the airport -- insist on the meter), or falsely claiming the often more-direct Sumner Tunnel to be closed and taking the much longer Williams Tunnel route instead. You should research your route and inform your driver what route you want to go, or look up the traffic conditions on your smartphone if possible, to avoid being cheated. Note that a $7.50 origination surcharge from the airport is lawful and permissible (including tolls). Airporter, Phone: +1 781-899-6161, toll free: +1 877-899-6161 [email protected] . Between Logan and the suburbs, door to door. If you're driving to Logan from the north, take the Callahan Tunnel; from the south or the west, take the Ted Williams Tunnel. Routes are well marked, and there is no toll in this direction. Driving from the airport to downtown Boston or to points north, including Interstate 93 northbound, take the Sumner Tunnel; for points south and west, including Interstate 93 southbound and Interstate 90, take the Ted Williams Tunnel. There is a $3.50 toll for either tunnel. Routes are well marked, but the airport road system is complex. Read the signs carefully and be sure you're in the correct lane, or you may be forced to swerve across several lanes of traffic to catch an unexpected off-ramp. If your final destination is a point outside of Boston, you may be better off flying into Manchester-Boston Regional Airport (IATA: MHT)  (50 miles north of Boston), Worcester Regional Airport  (ICAO: KORH) (IATA: ORH) (50 miles west of Boston), or T.F. Green Airport (IATA: PVD)  (60 miles south of Boston). Public transportation from these airports to Boston is infrequent, so if your final destination is Boston, renting a car is the best option. Boston is a global city placed among the top 30 most economically powerful cities in the world – its metropolitan area is home to the 6th-largest economy in the United States, and the 12th-largest in the world , making it a busy hub for business and charter aviation. Boston's colleges and universities attract more than 350,000 college students from around the world, and its tourism industry welcomes more than 20 million visitors annually. Amtrak, +1 800 872-7245, , the national passenger rail service, serves Boston. Boston has three intercity rail stations, which serve both Amtrak and MBTA commuter rail trains. South Station : Trains coming from west and south of Boston terminate here. Connections with the MBTA's Red Line and all branches of the Silver Line except the SL5. North Station: Trains from north of Boston (Amtrak Downeaster) terminate here. This station is located underneath the TD Garden sports arena, and is served by the MBTA's Orange and Green Lines. Acela Express runs high-speed service between Washington, D.C., Baltimore, Philadelphia, New York, and Boston, departing roughly hourly. Downeaster  runs 5 daily round trips between Boston and [[Portland (Maine)|Portland, Maine], three of which extend to [[Brunswick (Maine)|Brunswick]. Note that this is the only Amtrak route to terminate at North Station. Northeast Regional runs frequent service from Virginia up to Boston. Follows roughly the same route at the Acela Express, but with more local stops. Not high-speed rail, but still fairly fast (up to 125 mph) and considerably cheaper than the Acela. There is no direct train service between Canada and Boston. The Amtrak schedule is arranged such that transfers are impractical, especially going from Canada to Boston. You can do it if you're willing to stay overnight in New York City, Albany, Syracuse, or Rochester, but you'll pay for two trips. The local regional rail system is the MBTA Commuter Rail . If you are coming from Providence, the Commuter Rail is cheaper ($10 versus betweem $15 and $40) and more frequent than Amtrak. Remember, the North-South rule applies to which station you use. Below is a list of routes and the stations they terminate at. Fairmount Line, Readville to South Station via Uphams Corner. Fitchburg Line, Fitchburg to North Station via Leominster, Shirley, Ayer, Littleton, Acton, Concord, Lincoln, Weston, Waltham, Belmont, and Cambridge. Framingham/Worcester Line, Worcester to South Station via Grafton, Westborough, Southborough, Ashland, Framingham, Natick, Wellesley, Newton, and Back Bay. Franklin Line, Franklin to South Station via Norfolk, Walpole, Norwood, Westwood, Dedham, Readville, Hyde Park, and Back Bay. Greenbush Line, Scituate to South Station via Cohasset, Hingham, Weymouth, and Quincy. Haverhill Line, Haverhill to North Station via Lawrence, Andover, Wilmington, Reading, Melrose, and Malden. Kingston/Plymouth Line, Kingston or Plymouth to South Station via Halifax, Hanson, Whitman, Abington, Weymouth, Braintree, and Quincy. Lowell Line, Lowell to North Station via Billerica, Wilmington, Woburn, Winchester, and Medford. Middleborough/Lakeville Line, Middleborough to South Station via Bridgewater, Brockton, Holbrook, Randolph, Braintree, and Quincy. Needham Line, Needham to South Station via West Roxbury, Forest Hills, Hyde Park, and Back Bay. Newburyport/Rockport Line, Newburyport or Rockport to North Station via Rowley, Gloucester, Ipswich, Manchester, Hamilton, Wenham, Beverly, Salem, Swampscott, Lynn, and Chelsea. Providence/Stoughton Line, North Kingstown (RI) or Stoughton to South Station via Warwick (RI), Providence (RI), Attleboro, Mansfield, Sharon, Canton, Westwood, Hyde Park, and Back Bay. Arriving by train has the advantage of putting you within easy reach of most downtown destinations by public transit. Remember, Boston is NOT a city for cars! Most bus companies serve BOTH Logan Airport and the Boston South Station (which is also the Amtrak Station except the Downeaster Line @ 700 Atlantic Ave) . Other companies may only serve one or the other or elsewhere in the city. Check the below links. Fung Wah Bus Transportation, 700 Atlantic Ave (South Station Bus Terminal), ☎ +1 617-338-8308 ([email protected]), . Connecting Boston with New York's Chinatown (139 Canal St). edit WARNING: FUNG WAH BUS HAS SUSPENDED ALL BUS SERVICE UNTIL FURTHER NOTICE BY THE ORDER OF THE US DEPARTMENT OF TRANSPORTATION. PLEASE SEEK OTHER ALTERNATIVES. Greyhound and Peter Pan Bus serve many cities from South Station but are generally much more expensive than the so-called Chinatown buses, with Greyhound and PPB averaging $30 to the Port Authority bus terminal in midtown Manhattan (New York City). However, eSaver fares available online make the Greyhound fare between Boston & NYC as low as $15 each way. The Chinatown buses, along with low-fare competitors Megabus and BoltBus, specialize exclusively in nonstop express service between Boston's South Station and various points in NYC from Chinatown to midtown Manhattan. Some Chinatown buses average $12.50 one way. BoltBus and Megabus also include free WiFi aboard most buses to New York City. If you are driving in, you may seriously want to consider dropping your car at a lot and taking the "T" in. If you're heading downtown for the touristy sites, you will consider having a car a curse rather than a blessing. Parking at MBTA commuter rail and terminal subway locations is usually cheaper than parking in the city. In particular, the Riverside (Grove Street) stop at the end of the Green D line is right off I-95, and is $6 to park ALL DAY. Commuter rail stations are even cheaper. See the Public Transit section in the "Get around" section below. Boston has two major highways entering it, I-93 and I-90 (the Massachusetts Turnpike, or "Mass Pike", or "Pike"; locals do not usually call it "I-90", though they will know what you are refering to). I-93 enters the city from the north and the south; the section running from Boston southward is referred to as the "Southeast Expressway" but the northern section is just "93 North." The Pike enters Boston from the west. The Mass Pike is a toll road - expect to pay $1.25 to enter the city via the Pike, in addition to the tolls charged when arriving at the I-90 / I-95 interchange in Weston, just outside the city (variable based on distance travelled, max price is $3.85 if you drive all the way from near the New York border). Also, if you enter The Pike in East Boston (at Logan Airport) the toll is $3.50. There are minor roads, of course, that enter Boston as well, including Route 9 (Old Worcester Turnpike), Route 2, and US 1. Another major highway, I-95 (also known as Route 128) encircles the Boston area. There are many car rental places around Boston, including Zipcar, an hourly car rental service. If you don't plan to do much driving, this may be an economical alternative to owning a car. If you want to use Zipcar, you should try signing up in advance (students of universities in Boston may be able to get a discount). Rental fees and taxes differ between Boston and Cambridge, but the rental agencies at Logan Airport (in East Boston) are still usually less expensive and have a greater fleet of cars available. As a general rule, especially as a tourist unfamiliar with the city, alternatives are favored over driving - even when just getting in or out of the city. Boston is one of the densest major cities in the U.S. - perfect for walking, biking, or using the collection of mass transit systems known as the T. Driving can be confusing and dangerous with numerous one way streets, narrow roads, and continuous road construction. Driving conditions have improved after the completion of the infamous Big Dig (responsible for routing I-93 under the city), but it is still not recommended to those unfamiliar with the area. Black Falcon Cruise Terminal, One Black Falcon Ave, Phone: +1 617-330-1500 . The port of Boston ia a popular port of call with over 100 cruise-ship calls annually and also serves as home port for several cruise ships. The MBTA Silver Line SL2 bus service stops at the “Dry Dock Avenue” bus stop, one block from the Black Falcon Cruise Terminal, renovated in 2010 and located across from the Design Center. Navigating the streets of Boston is difficult if you are not familiar with the area. While other American cities have their streets laid out in a grid (New York, Chicago, Indianapolis, Philadelphia, Phoenix), or along a river, lake, or other geographical feature (New Orleans, Cleveland), the modern streets of Boston are a twisty and seemingly incomprehensible maze. Boston in the 1600s was a narrow peninsula surrounded by farmland and distant settlements. Landfill, urban expansion, waves of radical economic change, and new technologies have seen sensible street patterns added on to and collide in less sensible ways. Due to dense development, the older street patterns have largely remained in place without being adapted to their modern surroundings. 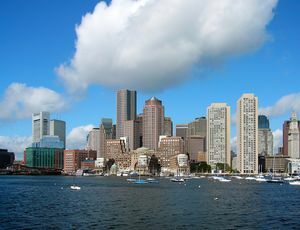 In this way, Boston is more similar to old European cities than most typical large American cities that were geometrically planned, expanded into unsettled land, or were mainly settled in the late 20th century. Driving is to be avoided if possible, due to traffic congestion, poor parking options, high driving-associated costs, the complexity of navigation, notoriously aggressive drivers, difficult-to-follow city rules and signage, and police that will gladly write you a ticket for even the most minor traffic violations. As an alternative (in fair weather), walking is usually preferable in terms of ease, cost, and comfort. Boston is known as an excellent walking city, since it is clean, historic, and generally-safe. It also has excellent public transportation  available in the metropolitan area and suburbs, to complement foot travel. Most tourist attractions are readily accessible by foot from the "subway" (the inter-connected, color-coded subway/trolley and hybrid-electric bus lines of the MBTA). Transfers between lines at connecting stations within the "subway" system are free. The only toll road in the area is the Massachusetts Turnpike (Interstate 90), with various prices depending on entrance and exit points. Other tolls include the Ted Williams and Sumner Tunnels, each of which charges $3.50 when coming back from Logan Airport into downtown. The Tobin Bridge on Route 1 headed southbound toward downtown charges $3. All toll roads, bridges, and tunnels in Massachusetts are all electronic and drivers who do not possess an E-Z Pass in their vehicle are sent a bill in the mail. Garages are located at Quincy Market, the Aquarium, the new State Street Financial Center, the Theater District and the Boston Common. There are three levels of parking under the Common. The garage is very clean and its central location makes it a good starting point for a day trip in the city. To get in and out of the garage, there are four pavilions on the Common; each has stairs and an elevator. Once out of the garage, the Park Street and Boylston Street subway stops are only a two or three minute walk away. As a rule, if you think you may be illegally parked, you probably are. Read the street signs very carefully. Watch for street cleaning, resident-only parking zones, and commercial parking zones - all of which will vary depending on the day and time. Parking meters are enforced heavily throughout the city. Meters in different parts of the city will turn off at different times (ie. 8PM downtown or 6PM in many other neighborhoods). A broken meter entitles you to the posted time limit without having to pay. Public transit in Boston is convenient and relatively inexpensive, and can take you directly to almost everything. A single public transit agency serves the Boston Metro area, the Massachusetts Bay Transportation Authority ("MBTA", or "the T" for short). The MBTA is the fourth-largest transit system in the U.S. For complete schedules, maps, and other information, see their official website at . It is important to note that "Inbound" means toward Park Street or State and "Outbound" means away from Park Street or State. Bicycles are sometimes welcome on the MBTA. Bikes are allowed on the Blue, Red, and Orange subway lines except at peak hours, but are not allowed on the Green and Silver lines. Bikes are always allowed on MBTA buses that are equipped with bike racks. The MBTA is currently installing bike racks on many bus routes - check the MBTA website for the latest updates. Bikes are allowed on MBTA boats and ferries at any time. On commuter rail trains, they are allowed anytime except weekday rush hours, as noted on individual train line schedules. The T consists of several components: subway, bus, water shuttles, and commuter rail. The subway is composed of four color-coded rail lines, the Red Line, Orange Line, Green Line, and Blue Line. Short of particular non-touristy spots in the suburbs, the subway can get you anywhere. Transit buffs take note: the Boston Subway is the oldest in America; the first segment opened on what is now the Green Line between Park Street and Boylston Street. This segment opened on September 1st, 1897. Photography of the MBTA is allowed now, until recently a photo permit was required. However there is the occasional employee who still did not get the memo. The Green Line splits into four branches going west that are known as the B, C, D and E lines (from north to south). Going west on the Green Line, the E line branches off at Copley Square station while the other three split at Kenmore Square station. Just after the lines split, these lines all run above ground and become "streetcar" lines. The B branch is a service to Boston College via Commonwealth Avenue (locally referred to and sometimes marked as Comm Ave). It services Boston College and Boston University along with the neighborhoods of Allston and Brighton. Many of the stops are dangerously close to the road; some are just painted yellow lines in the middle of Comm Ave and the right of way. Its long distance and frequent grade crossings cause dispatchers to express trains frequently. Make sure to press the stop tape to request a stop as many drivers won't automatically stop unless they are requested past Boston University or even past Kenmore. The C branch is a service to Cleveland Circle via Beacon Street. This line is primarily in Brookline, MA. Its right-of-way is mainly surrounded by local businesses and residential structures. It should be noted a few reasonable accommodations can be found along this line which may be an alternative to expensive downtown hotels. The D branch is a service to Riverside Station, an inter-model station in Newton, MA, via the Highland Branch, a former Boston and Albany railroad right-of-way from the 1800s that was converted in 1959. The right of way is completely grade-separated (meaning it does not intersect or run along streets), which makes transportation faster with stops being farther apart. The E branch is a service to VA Medical Center and Heath Street, via Huntington Avenue. This line services The Prudential Center and Boston's Symphony Hall. Many universities exist along this right of way along with research centers and the world famous Longwood Medical Area, which is a commercial and education complex offering some of the most advanced health care in the world. The Museum of Fine Arts Boston is accessible via the Museum of Fine Arts stop, which is sometimes announced as MFA or Museum on the trolley. The last few miles of the E branch run directly in the street so be mindful of traffic when boarding and leaving the trollies. The letters are not assigned to coincide with any particular reference to the route of the branch. It is labeled A-E (A since disbanded, now the 57 bus) from north to south. The Cleveland Circle (C), Reservoir (D), and Chestnut Hill Ave (B) stops are all within walking distance and provide a convenient spot to switch between the lines; however, a second fare is required. The Red Line splits in two directions going south that are known as the Braintree and Ashmont branches, the latter of which connects to a streetcar line to Mattapan. Going south, the Red Line splits at JFK/UMass station. The Orange Line, the eldest of the heavy rail rapid transit lines in Boston, is service from Malden, MA to Jamaica Plain. It services the City of Malden, Charlestown, Bunker Hill Community College, North Station, the Haymarket area, the Financial District, Downtown Crossing, New England Medical Center, Roxbury, and Jamaica Plain. This line has seen the most changes over the years as it once was the "el" over Washington Street and into Charlestown so if you have not been in town for 30-40 years you will notice dramatic changes in the route. The Blue Line, named as such because it crosses under the Boston Harbor and goes to Revere Beach, is a mostly a former narrow gauge railroad line converted to rapid transit. It services East Boston, the Airport, and Revere, with the Revere Beach stop a block from the beach. While the MBTA refers to the Silver Line as a rapid transit line (BRT or Bus Rapid Transit) route (it appears on subway maps), most Bostonians consider it part of the bus system. The Silver Line Waterfront is in fact a great way to get to the Seaport District or the Airport with a free transfer from South Station. The Dudley branch can be ignored for tourism purposes. When Bostonians say that they use the T, they're almost always referring to the subway, though the other modes of mass transit (bus, commuter rail, etc.) are still technically part of the T.
The subway system is slightly confusing in that directions are often marked "inbound" and "outbound", rather than with a destination. "Inbound" means "into the center of Boston", where all four lines converge at four stops: State (Blue and Orange), Park Street (Red and Green), Government Center (Blue and Green), and Downtown Crossing (Orange and Red). "Outbound" means "away from the center of Boston". Once one is in the center, signs generally give the direction ("eastbound") or the last stop on the line in that direction ("Alewife"). All trains are signed with the last stop in the direction they are headed, and this is the best way to know if you are going in the right direction. Note that most Green Line trains do not go all the way to the end of the line at Lechmere; most turn around either at North Station or Government Center. If you are traveling farther than Government Center, your best bet is to get on the first train that comes, and then wait at the stop where you are forced to leave the train for the next Lechmere or North Station train. (Depending where you are, Lechmere trains might not stop there.) Only trains coming from the E Branch will proceed to Lechmere, unless otherwise noted. Subway and light rail service generally does not run between 12 AM and 5AM. (The same goes for the commuter rail lines - usually midnight or before.) Each line (Green, Blue, etc.) has a "last train" time, starting at one end of the line and going to the other. Check the schedule in advance if you are going to be out late. Sometimes the last train is delayed due to passenger load or the need to wait for the last connection from another line, so you might get lucky if you are running late. Check with a T employee near the fare gates to see if you've missed the last train or not. A general rule of thumb is to be in the station by midnight to safely catch the last train. A consequence of this is that taxis can be extremely difficult to hail after 2AM when most of the bars close, especially in touristy areas such as Fanueil. Note: the MBTA extended its hours to 2:30 on Friday and Saturday nights on a trial basis as of March 2014. As of 2015, this trial period has ended, and last trains depart at Midnight every day of the week (however some trains may still be caught 15 minutes or so after Midnight). See the MBTA site for details. The cost of a one-way ride on the MBTA Subway is $2.00 plus FREE subway and local bus transfers (if done on a CharlieCard), or $2.50 if done on a Charlie Ticket or paying by cash. This will get you to most destinations. Parking at the Alewife station on the Red line is ample but will cost you $7 no matter when you come and go (for each 24 hour period). Riverside Station just off I-95 has plentiful parking for $5.75 all day. Additional suburban parking is available in Quincy, Braintree, and many Commuter Rail stops. Note that the Silver Line bus rapid transit line is split into discontinuous segments. Routes SL1 and SL2, departing from South Station, are considered part of the subway system (though their vehicles are dual-mode electric/diesel buses) and have free underground transfers to the Red Line. Routes SL4 and SL5 are considered part of the bus system, and have the lower local bus fare fare. Although Route SL4 also stops at South Station, it stops outside the station complex, and transfers between SL4 and the other Silver Line routes or the Red Line are only free with a CharlieCard. The MBTA runs a number of water shuttles, but the most useful for tourists is the shuttle from Long Wharf to Navy Yard, which costs $3.00. This provides a convenient connection between the USS Constitution Museum and the area around Faneuil Hall and the New England Aquarium. There's also a shuttle from Long Wharf to Logan Airport, but it runs relatively infrequently, so the Blue Line is your best bet for getting between these two destinations. There are also non-MBTA public ferries available from several ports, notably the Aquarium and Long Wharf, and a water taxi service on the waterfront. Commuter rail  in Boston is primarily used for traveling to towns outside of the city. Due to its limited frequency compared to the subway, it is not generally recommended for travel within the city itself. An exception is travel between Back Bay Station and South Station, which is served by 5 commuter rail branches on weekdays and is free one way. Commuter rail fares range from $2.10-$11.50 one way, although any ticket to or from the city is at least $4.25. Tickets can be bought on board trains, but at a slight surcharge. Passengers can ride for free from Back Bay to South Station, but must buy a ticket for $1.70 to travel from South Station to Back Bay. Trains heading north of the city leave from North Station, while those heading south or west leave from South Station. 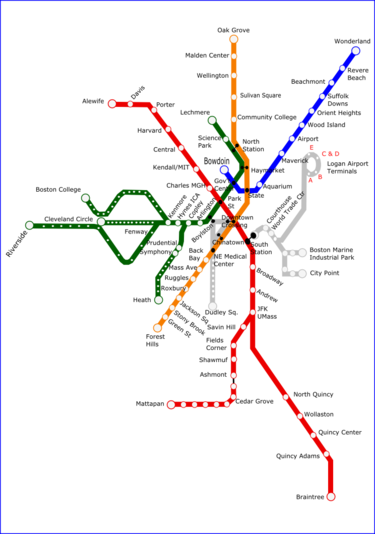 Both stations have connections to the subway: North Station is on the Green and Orange Lines, and South Station is on the Red and Silver Lines. The two stations are not directly connected: you cannot board a train north of the city and take it to a point south of the city. Such a journey will require a subway ride in-between train trips to make the connection. Your current alternative to late-night public transit is a taxi. Taxis can be hailed at any significant street corner, such as Kenmore Square or Copley Square. Expect to spend at least $5 and possibly up to $30 in the immediate surroundings (this includes the initial fare, a small tip for the driver, small one-way streets, bad traffic, construction, tolls for bridges, tolls for tunnels, tolls for the Mass Pike, and any wait time). To get further out of Boston, expect to spend much more (for example, from the airport to Wellesley, a Boston suburb, would be around $80, which includes the actual driving and tolls along the way). Fun fact, as of summer 2009, Boston has the most expensive taxis of any major American city. The climate is cold from December to April, and the city is the windiest in America. Snow can also be an obstacle. Many Boston residents use bicycling as their primary mode of transit all year round, and Boston's small size and relative flatness make biking an appealing way to get around. Boston lacks many amenities for bicyclists, however, as the roads are covered with potholes and frequently absent of designated bicycle lanes or bicycle racks, so visitors wishing to travel by bicycle should have excellent urban riding skills prior to renting a bicycle. Cambridge tends to have more bicycle lanes and racks, though many streets still lack them. Riding on the sidewalk is frowned upon in the city of Cambridge and Boston, and being well-lit in the evenings is important both for following regulations and for being safe. Recent efforts by Mayor Thomas Menino promise increased city investment in bicycling as a viable mode of transportation, and the mayor himself has taken up biking around town. On July 28, 2011, Boston launched New Balance Hubway a bike sharing system that now has 140 stations and 1300 bicycles. The cost is $6/day, $12/3 day pass, and $85 for a yearly membership. For this fare, you can make unlimited use of bikes during the period, while sticking to a maximum of 30 minutes per trip. So you take a bike and park it somewhere (else) within 30 minutes. Repeat this procedure as often as you want! 1 Hour of continuous use costs $2 extra per time of use. There are several visitor pass programs that offer discounted or free admission to a number of the sites listed below, among them the Go Boston Card  and the Boston CityPASS . Depending on the length of your stay and what you want to see, either program could potentially save you quite a bit of money. Boston Children's Museum, 300 Congress St, 10AM-5PM daily (F until 9PM), +1 617-426-7336 . $12, Ages 2-15 $12, Age 1 free. Boston Athenæum, 10½ Beacon Street, Mon-Thur 9AM-8PM , Fri 9AM-5:30PM, Sat 9AM-4PM, Sun 12PM-4PM, +1 617-720-0270 . The first floor is FREE and open to the public. Admission to the gallery is a suggested $5 donation. Admittance to the remaining floors is limited to members. Free and open to the public docent-led tours are held each Tuesday and Thursday at 3pm. Advance registration is required. The Boston Athenæum is a private membership Library, museum, and civic forum. Membership is open to all who apply. Museum of Fine Arts, 465 Huntington Ave. (Museum of Fine Arts station, Green Line, E Train), +1 617 267-9300, . ($25, Free for ages 7-17 after 3PM weekdays, all weekend, and public school holidays; otherwise admission for youths is $10). Boston's largest and most comprehensive art museum, and also one of the pricier museums in the US. Currently undergoing an expansion project, it is also known for its impressive assortment of French Impressionist paintings, with the largest collection of Monet paintings outside of Paris; it also has the largest collection of Japanese art outside of Japan (there is also a branch of the museum in Nagoya, Japan), an extraordinary collection of Egyptian, ancient Greek, and Roman art, one of the most comprehensive collections of American art, and one of the largest and finest print collections in the United States. This Museum may be one of the best art museums in the entire country. If you’re visiting Boston and looking for a great place to bring the family the Museum of Fine Arts is a great place to go. The museum is full of great paintings and artifacts. 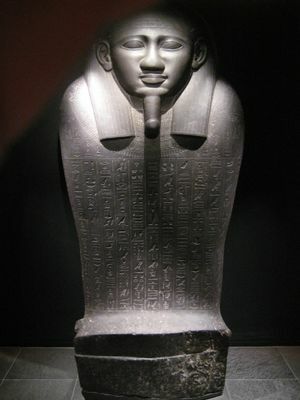 Some of the more popular exhibits include the Egyptian exhibit that is home to multiple mummies, beautiful tombs and coffins. The paintings in the Museum are also very impressive and many of any the paintings portray famous historical American heroes like George Washington, Samuel Adams, Paul Revere and much more. The Collection of Historical Scientific Instruments, 1 Oxford St., Cambridge, +1 617-495-2779, . T stop: Red Line to "Harvard Square". M-R 11AM-4PM, F 11AM-3PM. Free and open to the public (despite at least one Web page that can be misread to indicate that it is by appointment only). Closed on University Holidays. Has over 20,000 objects dating from 1400 to present day. Harvard Art Museum, 32 Quincy St, Cambridge, (Harvard Square Station, Red Line), +1 617-495-9400. T-Sa 10AM-5PM. $9, $6 students. Harvard Museum of Natural History, 26 Oxford St, Cambridge, +1 617-495-3045 . T stop: Red Line to "Harvard Square". 9AM-5PM daily. As of Sept. 1, 2012: $12, students $10. Its amazing "Glass Flowers" collection has been a major tourist attraction for nearly 100 years. Institute of Contemporary Art, 100 Northern Ave (Courthouse Station, Silver Line), +1 617 478-3100 . The much-anticipated new building designed by starchitects Diller+Scofidio, the ICA is on Fan Pier on the South Boston Waterfront. Isabella Stewart Gardner Museum, 280 The Fenway (MFA Station, Green E Line), +1 617-566-1401 . Tu-Su 11AM-5PM. The villa-turned-museum of an eccentric Bostonian, the Gardner features an eclectic collection of European objects, beautiful floral displays, and was the site of a spectacular painting heist in 1990. $15, Students $5, Free on your birthday or if you're named "Isabella". MIT Museum, 265 Massachusetts Ave, Cambridge, (Red Line to either "Central Square Station" or "Kendall Square/MIT"), +1 617-253-5927  10AM-5PM, closed major holidays. The MIT Museum is a place that explores invention, ideas, and innovation. Home to renowned collections in science and technology, holography, architecture and design, nautical engineering and history, the Museum features changing and ongoing exhibitions, unique hands-on activities, and engaging public programs. Museum of Science, Science Park (Science Park Station, Lechmere-bound Green Line trains). +1 617-723-2500 . 9AM-5PM daily (Summer until 7PM). $21 plus a la carte menu of attractions. 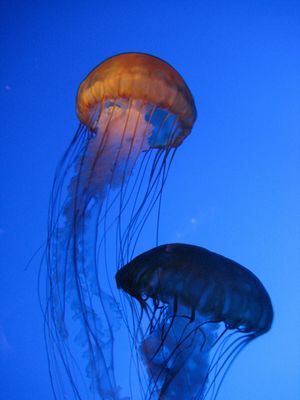 New England Aquarium, Central Wharf (Blue Line to Aquarium), +1 617-973-5200 . M-F 9AM-5PM, Sa Su 9AM-6PM. Home of what was until recently the world's largest fish tank, according to the Guinness Book of World Records. Great fun for kids of all ages. Whale watching tours available, too. $20.95, Students $18.95, Senior 60+ $18.95, Ages 3-11 $12.95. Mapparium, 175 Huntington Ave (Green Line to the Prudential, Symphony, or Hynes/ICA stop), +1 888-222-3711 . The Mary Baker Eddy Library at the world headquarters of the Christian Science Church houses a three story globe room where visitors can view a stained-glass map of the world from inside the center. Tu-Su 10AM-4PM. The $6 admission covers most of the museum and library. Peabody Museum of Archeology and Ethnology, 11 Divinity Ave, Cambridge (Red Line to "Harvard Square"), +1 617-496-1027 . Daily 9AM-5PM. One of the oldest museums in the world devoted to anthropology and houses one of the most comprehensive records of human cultural history in the Western Hemisphere. Semitic Museum, 6 Divinity Ave, Cambridge (T stop: Red Line to "Harvard Square"), +1 617-495-4631 . M-F 10AM-4PM, Su 1PM-4PM. See a collection of over 40,000 artifacts from the Near East across multiple ancient civilizations. USS Constitution Museum, Charlestown Navy Yard, +1 617-426-1812 . Apr-Oct Tu-Su 10AM-6PM, Nov-Mar Th-Su 10AM-3:50PM. Tour famous Old Ironsides, enjoy all-ages hands-on exhibits on sailing skills and crafts. Freewill donation. Warren Anatomical Museum, 10 Shattuck St, (T stop: "Brigham Circle" on Green E line), +1 617-432-6196,  See an extensive collection of distinct and pathological examples in anatomy including the actual skull of Phineas Gage. M-F 9AM-5PM, except Harvard University holidays. Panopticon Gallery, Inside the Hotel Commonwealth 502c Commonwealth Ave, (T stop: Green Line to "Kenmore Square"), +1 617-267-8929 . M-F 10AM-6PM, Sa 11 AM-5PM. Founded in 1971, Panopticon Gallery is one of the oldest galleries in the United States dedicated solely to photography. The gallery specializes in 20th Century American Photography and emerging contemporary photography. Axelle Fine Arts Galerie, 91 Newbury St, (T stop: Green Line to "Arlington St."), +1 617-450-0700 . Everyday 10AM-6PM. First established in Soho, New York, it offers the best selection of contemporary European painters to its clients. Axelle Fine Arts Galerie has an ever-evolving selection of new, museum-quality paintings and is the exclusive representative of artists such as Patrick Pietropoli, Goxwa, Albert Hadjiganev, Jivko, Philippe Jacquet, Fabienne Delacroix, André Bourrié, Jean-Daniel Bouvard, Laurent Dauptain, Philippe Vasseur, Michel Delacroix, Brian Stephens and Hollis Dunlap. March: St. Patrick's Day, . March 17th is not celebrated officially as St. Patrick's Day, but rather as Evacuation Day, a local holiday marking the expulsion of British troops from the city on 17 March 1776. But Boston has one of the highest Irish populations outside of Ireland, and Irish pride reigns on this day. Don't forget to wear green, drink a beer, and buy something that says "Kiss Me I'm Irish!" (regardless of your ethnicity). If possible, catch the local band Dropkick Murphys (you know, the people behind "Shipping Up To Boston") at their infamous St. Patrick's Day show. Third Monday in April: Patriot's Day/Boston Marathon . The oldest marathon in the world, the race started in 1897 and is always run on the holiday that commemorates Paul Revere's ride in 1775 and the ensuing battles at Lexington and Concord (suburbs of Boston) that started the Revolution. The race runs from Hopkinton to the finish line in Copley Square. The halfway point is the wealthy suburb of Wellesley, where students from Wellesley College (America's leading institute for all-women's education) form the "Scream Tunnel" to cheer on runners (who are in turn encouraged to "Kiss a Wellesley Girl for good luck!"). Parts of Commonwealth Avenue outbound from there and surrounding streets are closed for the race. Elsewhere, Paul Revere's ride and the battles are re-enacted each year in front of thousands of people. Arrive early to get a good spot. Finally, the Red Sox always have a home game on this date, which starts at 11AM to accommodate the crowds who watch the Marathon as it goes by Fenway Park. This is the only Major League baseball game that starts before noon local time during the season. Other than St. Patrick's/Evacuation Day this is the only time that you will find huge crowds at bars early in the morning. June: Boston Pride  The second-largest event in the city after the Fourth of July. Boston's LBGT community - and everyone else - comes out for a fabulous parade from Copley Square, through the South End, to Boston Common. Many other social events are scheduled around this weekend. The Fourth of July: Independence Day . A host of events occur throughout the day that culminate with the Boston Pops concert on the Esplanade along the Charles river - the oldest and largest public celebration of the Fourth in the country. The concerts were started in 1929 by conductor Arthur Fiedler and were enhanced with fireworks by philanthropist David Mugar during the bicentennial celebrations in 1976. Sometimes sparsely attended in the beginning, it is televised nationally and has become the country's premier 4th of July event with hundreds of thousands squeezing along both sides of the Charles each year. This event also holds the world record for the largest crowd to ever attend a classical concert. Seats closest to the stage go to folks who show up before dawn to wait in line but there are speakers and huge TV screens posted all along the river so everybody can see the show. Parts of Storrow Drive in Boston, Memorial Drive in Cambridge, and Massachusetts Avenue on and near the Mass. Ave. bridge are closed due to extremely heavy pedestrian traffic. Note that the roads and public transit are heavily congested after the fireworks display. There are other celebrations during the day, starting with a flag-raising ceremony at City hall at 9AM. This is followed by a parade to the Granary Burial Ground which is led by the Ancient and Honorable Artillery Company, Boston's militia, which is the 3rd-oldest military unit in the world. Honors are given at the graves of each of the signers of the Declaration of Independence who are interred there, as well as the victims of the Boston Massacre and Peter Faneuil. The parade then moves on to the Old State House where the Declaration is read in its entirety from the main balcony (which overlooks the site of the Massacre) to the crowd, just as it has been every year since 1776. Arnold Arboretum, 125 Arborway, Phone: +1 617-524-1718. T stop: Orange Line or Needham commuter rail to "Forest Hills" (last stop on the Orange Line). Come see the oldest public arboretum in North America and one of the world's leading centers for the study of plants. A park with beautiful landscaping and specimens. Boston Harbor Islands State Park, Phone: +1 617-727-5290 . Take a Ferry (Long Wharf: Blue line to Aquarium), Phone: +1 617-223-8666 ) out to Georges Island and tour Fort Warren. See why Boston was the most defensible city in the New World. Shuttles leave from there to other islands in Boston Harbor--insect repellent is recommended. Ranger-led activities, events, narrations, or just swim, picnic, camp or fish. This is a hidden jewel that is off the beaten path. Plan to bring sunscreen, water, and a snack. Also note that depending on conditions in the harbor the return schedule can be delayed. If you're tight on time, err on the side of an earlier ferry to ensure arrival. Newbury Street  Eight blocks of high-end boutiques, hair salons, and galleries. Makes for a fabulous day of shopping and dining. The shops and restaurants tend to be expensive, but one needn't spend money to enjoy the area; one of Newbury's main attractions is simply people-watching. College students, urban professionals, tourists, and street performers all mix here. Newbury Street is accessible on the Green Line from the Arlington, Copley, and Hynes stations. Freedom Trail. A 2.5 mi (4 km) walking tour of 16 historic sites that begins at Boston Common, goes through downtown Boston, the North End and Charlestown, ending at the USS Constitution. Sites include the old State House, Faneuil Hall, Paul Revere's House, and the Old North Church. 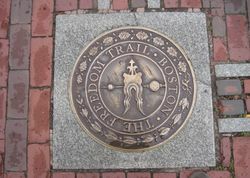 The Freedom Trail connects to the Boston Harbor Walk. The Freedom Trail is marked by a line of red paint or red brick in the sidewalk. The beginning of the trail is accessible on the Green Line or the Red Line from Park St station. However, all the lines are convenient at various points along the way, via several downtown stations. Faneuil Hall  and Quincy Market, downtown Boston. Faneuil Hall and Quincy Market, two of Boston's oldest marketplaces, contain a great set of mainly tourist-oriented shops and eateries. Since Faneuil Hall Marketplace is private property, the street performers must audition and thus are consistently entertaining. Faneuil Hall also has a historic meeting hall in its upper levels, and is just down the street from the Old State House. Quincy Market has a number of food stalls from local (delectable) providers - coffee, pastries, candy, popcorn, sushi, Italian, lobster and lobster rolls, Chinese, sandwiches, etc. No farmers' market, all food is prepared. Great place to eat a wide variety of foods for cheap, especially with kids. Tables available in covered outdoor area immediately outside. Accessible on the Blue Line at State St., Government Center, and Aquarium stations, on the Orange Line at State St. station, and on the Green Line at Government Center station. Copley Square. Take a Duck Tour, +1 617-267-DUCK , enjoy the fountains, visit the top of the nearby Prudential building, see the Boston Public Library, visit the beautiful Trinity Church, or go shopping along Newbury Street. Accessible on the Green Line at Copley station, or on the Orange Line at Back Bay station. Boston Symphony Orchestra. Symphony Hall, Symphony Hall, 301 Massachusetts Av, . During the fall, winter and spring, the world-renowned Boston Symphony Orchestra performs classical music. Tickets are available online or in the box office; they can be pricey at $29-$115. For a cheaper alternative, Tuesday and Thursday concerts have rush tickets (last-minute availability, no seat choice) which are sold starting at 5PM on the day of the concert for $9; Friday concerts start rush ticket availability at 10AM. Be sure to line up in advance for rush tickets. Weekend concerts do not sell rush tickets. Boston Pops Orchestra. Symphony Hall, 301 Massachusetts Av, +1 617-266-1492, [email protected] During the summer, the Pops perform programs of both classical and popular music, consistently pleasing audiences. Tickets can be had inexpensively and can be purchased either online or in the box office. Accessible on the E branch of the Green Line at Symphony station. New England Conservatory. This world-famous top-notch music school and also right around the corner from the Boston Symphony, is often overlooked by tourists in Boston but well-known among local musicians. Their performances, recitals, and chamber group concerts are usually free and unticketed. See the calendar at  for more information. Theater District. Washington St, Tremont St. Broadway is the undisputed center of the theater world, but Boston's Theater District is where most Broadway shows will preview and is usually the first stop on a show's touring run. Resident shows also run. Bicycling. 20 Park Plaza (Suite 528), +1 617-542-2453. The Minuteman Bikeway is one of the most heavily used rail trails in the United States. This eleven mile paved path is popular with walkers, cyclists, and in-line skaters. The route closely follows that taken at the beginning of the Revolutionary War. Accessible on the Red Line at Davis and Alewife stations. Prudential Center Skywalk Observatory. Prudential Center, +1 617-859-0648. Tickets: Adults $20, Seniors $16, Children under 12 $14, Student with college ID $16, Military with DoD ID Free. Look around Boston from the second tallest skyscraper. Open daily. Winter (Nov thru Feb) 10AM-8PM; Summer (Mar thru Oct) 10AM-10PM. Sam Adams Brewery Tour. Phone +1 617-368-5080, 30 Germania St. (Orange line to "Stonybrook"). Take a tour of the Sam Adams brewery located in Jamaica Plain. Free samples of beer at the end. Harpoon Brewery Tour Phone +1 888-HARPOON. (Silver line Waterfront, fourth stop from South Station) Free sampling after tour. Fenway Park, 4 Yawkey Way. The home of the Boston Red Sox . The oldest baseball stadium still in use by the major leagues, this brick and stone structure is named after and located in the Fenway neighborhood of Boston, which itself takes its name from the fens, or marshes along the nearby Muddy River. Accessible on the B, C, and D branches of the Green Line at Kenmore station, or on the D branch of the Green Line at Fenway station. Visitors arriving via the T will need to walk a short distance from the station to the ballpark, but the crowds on a game day will serve to lead the way. Its worth taking the T to the game because parking is very limited (and expensive) and you get to experience the excitment of a crowded train car full of fans heading to the game. Yawkey Way is now closed off during games, and those in the stadium can walk outside to enjoy the additional refreshment stands and open area, and then return to the game. With sold-out crowds every game, getting tickets can be difficult. Street resellers will offer tickets outside the stadium, and those will get progressively cheaper as the game goes on. Buying tickets on the street bears a risk of fraud, but most of the tickets are real. More cautious visitors can take a worthwhile Fenway Park tour on non-game days or game days (leaves from the souvenir store on Yawkey Way). Gillette Stadium . The home of the New England Patriots football team  and the New England Revolution soccer team  is in the town of Foxborough, about 25 miles southwest of Boston. The Revolution play from spring to fall, and the Patriots from fall through winter. Patriots games are always sold out and getting tickets will probably be impossible. Revolution tickets will be easier to come by. Starting in 2012, Gillette Stadium will also become the football home of the UMass Minutemen —the team of the University of Massachusetts Amherst—as they make their move to the top tier of NCAA college football. TD Garden , Causeway St. The home of the Boston Celtics basketball team  and Boston Bruins hockey team . The site was previously occupied by the Boston Garden, a smaller venue, and the existing structure was previously called the FleetCenter and later the TD Banknorth Garden. The arena may be called by any of these names, or simply The Garden. Accessible on the Green Line or Orange Line at North Station, which is underneath the Garden.The TD Banknorth Garden is home to two of Boston’s most historic sports team the Boston Celtics and the 2011 Stanley Cup Champions the Boston Bruins. If you’re a sports buff visiting Boston and one of these two teams is playing it is a must that you stop by a catch a game. Whether your sitting up high or down low finding a bad seat in the Garden is pretty hard for any sport even in last row you will still be able to see an exciting game in a very exciting atmosphere where history is made. Another notable annual sports event is the Beanpot college hockey tournament , held on the first two Mondays of February and featuring the men's teams of Boston College (see below), Boston University, Harvard University, and Northeastern University. Boston College Eagles , Brighton/Newton Border in the neighborhood of Chestnut Hill. The teams representing Boston College compete in the Atlantic Coast Conference (ACC) in most sports alongside 11 other schools along the East Coast. The ice hockey teams for both men and women compete in Hockey East. The football team plays in the 45,000-seat Alumni Stadium. The basketball and hockey teams play in the adjacent Conte Forum (known as Kelley Rink for hockey games), which seats between 8 and 9 thousand fans. College hockey is very popular in New England, and in recent years BC has had one of the best programs in the nation. See also the hockey programs of Boston University and Northeastern University in the city proper, and rival schools in the suburbs and neighboring states. Harvard Stadium, 95 N. Harvard St., Allston. Home to the Harvard Crimson (Harvard University) football team since 1903, it is also home to the area's newest professional team, the Boston Breakers of Women's Professional Soccer. The Breakers, like the Revolution, play from spring to fall. The Cambridgeside Galleria.This boilerplate shopping mall includes department stores, the Apple Store, a Best Buy, clothing stores, bookstores, a food court, and a Cheesecake Factory restaurant, all at mainstream retail prices. Accessible on the Green Line at Lechmere station, or the Red Line at Kendall/MIT station via a free shuttle van ("The Wave"). Copley Place and Prudential Center. These malls are connected via pedestrian walkway over Huntington Av. They house department stores, clothing stores, bookstores, upscale shopping, a food court, many restaurants, and connect to several large hotels. Accessible on the Green Line at Copley, Hynes/ICA, and Prudential stations, and on the Orange Line at Back Bay station. `Visitors and locals alike use the mall to go between the South End and Newbury/Boylston Street areas, either to take advantage of the air conditioning during the summer or the warmth during the winter. Downtown Crossing(or "DTX"), Washington St. at Winter St. area. This shopping district is in Downtown Boston, just steps from Boston Common. The building, which once housed the now-closed Filene's Department store, was knocked down and there were plans for a 38-story tower which was to include a hotel and condos to be built. However, the development has since stalled due to financial problems of the developer. To date there has been no date for redevelopment set, so the location is now most infamous as the "Filenes Basement Hole." The rest of Downtown Crossing features large Macy's, music stores, souvenirs, general retail, and lots of street vendors and quick food. Accessible on the Red and Orange Lines at Downtown Crossing station, and with a brief walk, from the Red and Green Lines at Park St. station. Be advised: During weekdays this area is a very popular hangout for inner-city youth. The North End is full of Italian eateries, and it's certain that you'll find something here to your liking. Take the Green or Orange Lines to the Haymarket station, cross the Greenway park(what used to be Interstate 93 pre-Big Dig), and then follow the signs to Hanover Street, the main commercial thoroughfare. Most of the good restaurants are on this street or on side streets. If you visit the North End on the weekend in the summer you may encounter one of many saint's festivals. Streets are closed off and there are music, food, and parades of the saint's statues. 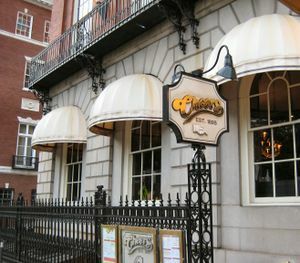 The Bull & Finch Pub in Beacon Hill was the inspiration for the hit television show "Cheers." Very pricey for bar fare, but an essential part of the Boston tourist experience. The Beacon Street address is the original and does not look much like the set of the show. There is another Cheers at Faneuil Hall which is more of a replica of the TV set. If you ask a local for directions to Cheers, you may be directed to Faneuil Hall. The Beacon Street bar is referred to by its original name. Both locations are very touristy complete with souvenir shops. Despite having a huge student population, the political clout of residential neighborhood associations who value late-night peace and quiet has historically kept Boston from offering many options for late-night dining. Most restaurants close by 10 or 11pm, even in college neighborhoods such as Allston and Brookline. Bars stay open till 2am for drinking but their kitchens usually close at midnight or earlier. Exceptions are found in Chinatown, where several eateries serve their full menu till 2AM or later, and in the South End, where dining until midnight is possible even early in the week. If you're planning a long night, though, it's probably best to plan ahead and buy some snacks in advance. Boston also has a thriving food truck scene. The best way to find the food trucks and figure out where the are is your iPhone or Android. Harvard Ave/Brighton Ave in Allston - Since Allston is a "College Ghetto" this is a great place to be if you're younger than say 27. There are a couple establishments worth the trip for any age, too. Faneuil Hall - For the younger, dancier, suburban and tourist crowd. There are multiple nightclubs and lounges near the Theatre District, Chinatown, in the Faneuil Hall area as well as in Cambridge. More nightclubs can be found in the district articles. Samuel Adams Brewery in Jamaica Plain and Harpoon Brewery in South Boston both offer tours and tastings. Trillium Brewing Co. is an acclaimed craft brewery, and a short walk from Harpoon, but be aware that they do not offer tastings on site. Many other small-scale craft breweries can be found in Greater Boston cities such as Everett, Chelsea, and Somerville. Several operators run tours by vehicle between local breweries so that you may sample without the need to drive under the influence. Boston does, however, have some outstanding independent coffee shops as well, including the Boston Common Coffee Co. with multiple locations including one near Boston Common. Some neighborhoods (especially Roxbury, Roslindale, Mattapan, and Dorchester) are more dangerous than average, and extra care should be taken there. It is even better to avoid walking in these areas at night if possible. Still, the biggest threats for tourists in Boston are mostly pickpockets. Boston makes an excellent starting point for any tour of New England. Take a ferry from the harbor in the summer or one of several daily Cape Air flights from Logan year-round to Provincetown (also known as P-town) to see some of the best entertainment and fun on Cape Cod. Take a ferry from June to October 31st and visit the World Wide Capitol of Haloween in the Historic Sea Port of Salem (Massachusetts). The Salem Ferry is a 92 Foot High Speed Catermaran that travels at 32 knots. The MBTA offers train service from Boston´s North Station 12 Months a Year along with bus service from Haymarket. Hire a car and drive to New Hampshire. New Hampshire has many quaint towns, lakes and mountains in addition to grand historic hotels, countless breweries and a small but beautiful stretch of coast. Visit Portsmouth (1.15 hour drive), the Monadnock region (1.75 hour drive) or the White Mountain National Forest (2.5 hour drive). Also on Cape Cod, Hyannis offers great beaches during the summer and plenty of food and nightlife year round, and is also the departure point for ferries to Nantucket. About a 90 minute drive each way, although plan extra time to account for bridge traffic on summer weekends. Hourly bus service is available 6am-Midnight from South Station to Hyannis on Plymouth & Brockton. Drive south or take the $11.50 commuter rail (Providence/ Stoughton Line ) or $17 express Amtrak to Providence, Rhode Island, which is home to its own share of art and culture, excellent Italian food, and a charming downtown area. A popular road trip is "Boston to the Bronx". The Drive is approximately 3.5 hours along US-20 or I-95. Minimum suggested time for the return trip is 2 days. New York City can also be reached by frequent bus service from South Station on Greyhound, Peter Pan, Megabus, BoltBus, Yo! Bus, Lucky Star. Walkup fares usually $15-$25 each way, less if you book a week or two in advance or take one of the Chinatown lines. (Note that Fung Wah busses, which developed an extremely poor safety record, was permanently ordered shut down by the Commonwealth and the federal government early in 2013.) Amtrak's North East Corridor also serves New York, but expect to pay $60-$100 each way, more if you take the high speed Acela Express. Drive south to Falmouth and Woods Hole and take the ferry to Martha's Vineyard for a peaceful, scenic time on this small, charming island. Drive northwest on Route 2 or take the Fitchburg commuter rail  to historic Concord, where you can visit Minuteman National Historic Park, the site of the battles of Concord and Lexington; the homes of the authors Ralph Waldo Emerson, Nathaniel Hawthorn, or Louisa May Alcott; or Walden Pond, made famous by Henry David Thoreau in his book "Walden; or, Life in the Woods". Take a day trip north to the town of Salem, the home of the infamous Salem witch trials. Wrentham Village premium outlets. While not in Boston, a shopping trip to Boston by an international tourist is not complete without a visit to Wrentham Village. Its location off I-495, exit 15 makes it under an hour from Boston and most hotels will arrange transport. Wrentham’s stores range from the finest designer fashions and jewelry to home furnishings, housewares and electronics. You'll find all the big brands such as Hugo Boss, Adidas, Nike, DKNY, Burberry, Gap, Guess, Ann Taylor, Tommy Hilfiger, Ralph Lauren, Levi’s, Liz Claiborne, Swarovski, Royal Doulton, Calvin Klein, Benetton, Waterford Crystal, Williams-Sonoma and much much more. This page was last edited on 17 November 2018, at 07:46.